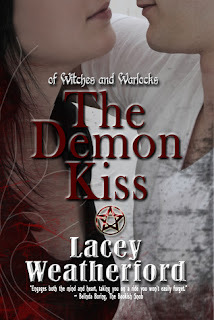 **We were so excited to participate in the IBC's Masquerade this week we ran our review for Lacey Weatherford's The Demon Kiss one day earlier than scheduled. We apologize for the snafu. ** Everyone who comments below will receive a FREE ebook copy of this second title in Of Witches and Warlocks YA series. Also every commenter on Lacey Weatherford's website will get the book (for FREE!) and be entered into her grand prize giveaway affectionately titled "Portia's Potions," which is a fun little potions kit full of candy masquerading as poisons, potions, and tonics. Book blurb: Can someone else's past come back to bite you? Book blurb: After being drained of nearly all the blood in her body, novice witch, Portia Mullins, wakes up to find that her warlock boyfriend, Vance Mangum, has fled in search of his demon father. Determined to keep him from facing the evil alone Portia follows after him, unknowingly setting herself on the path of a new adventure that will take her, Vance, and their coven over international borders, into a foreign place where they will discover that the black magic which awaits them is far worse than they ever imagined. Portia finds herself tangled up in a web of lies and deceit in another's quest for demonic power in the excitingly romantic second paranormal novel in the Of Witches and Warlocks Series, The Demon Kiss. My review: This second installment of Of Warlocks and Warlocks series starts off with Portia awakening after nearly being bled dry by her boyfriend, Vance. We know from the ending of the first book that Portia saved him from becoming a full demon but.... he still has the dark tendencies of one, the glowing red eyes and the bloodlust. Understandably, Portia is upset at finding Vance gone. In pure Portia style she doesn't mope around the house, she goes after him with the help of Shelly and Brad. The author doesn't bog down the story with unnecessary suffering and our heroine soon finds Vance. In a touching scene, the most romantic couple in YA reunite and Portia punches him. I expected nothing less from her. From here on the story takes us on their journey to find Damian, the evil demon father of Vance who is definitely up to something sinister. Along the way we see Shelly and Brad's relationship changing as well as the deepening of Portia and Vance's commitment to each other. My favorite couple also get engaged. At sixteen, some may think Portia is too young. In some cultures, 16 is the norm, and anyone who sees these two together knows they belong together. Onto Mexico the group travels, following Damien's paper trail. It seems he is bringing in items from other countries and Portia's coven has to figure out what. They learn about the dreaded "devil's kiss" from a shop owner and actually witness it during a surveillance night. The pacing did slow down for me at times and I didn't mind since Weatherford shared tender moments between Vance and Portia. They are so adorable together, loving, caring, reveling in the newness of young love. When Portia touches Vance's face to help him deal with the lure of his bloodlust, you can feel her love for him slip off the page and when he kisses her in front of everyone in the coven, you know this is a guy who wants the world to know she is his greatest love. The Demon Kiss is a wonderful continuation of our young witch and warlock's next life chapter filled with humor, emotional outbursts, action, revelations and the strengthening of a timeless love affair. Lacey Weatherford's writing is straight forward, tight, well paced, and I liked the concept of a devil's kiss. Fans will not be disappointed. There's a reason her Of Witches and Warlocks series is selling well--it's evidenced on the pages. Cover comment: I love the redesigned covers and how Portia and Vance are cut off but you know they're staring at each other. Just romantic enough. Wow, what a generous giveaway! Great review. I haven't read the first book yet, sounds like a great series and one I'm sure a couple of my older kids would like too! Sounds like a great book. I following the tour so would love to have this second book at well. Thank you for the review, the reference to "devil's kiss" piqued my interest. Thanks for sharing your lovely review today. I hopped over from the Masquerade to see what you had to say. I think this series is excellent and I look forward to the whoooooole thang! I don't know how I feel about a girl chasing after a man who nearly killed her. Guess I need to get the first book too to understand her motives. I really enjoyed the first book, and am looking forward to The Demon Kiss, and all the following books in this series. I just finished with the first book and loved it!! I can't wait to read the second book. Totally in love with this series......I just can't get enough. LOVED the first book! Can't wait to read the second book! The first book was great! Cant wait to read the second one! Couldn't put the first one down. I can't wait to read this one. I couldn't put the first book down. I can't wait to read the second book. I loved the first book. It took only two days to read. I cant wait to read the next one.